a. 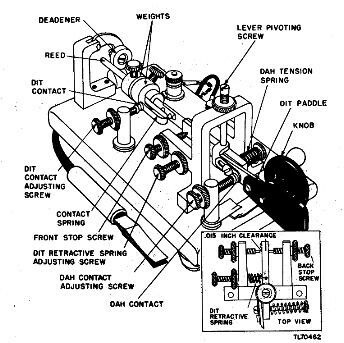 In sending with the bug the thumb presses against the dit paddle (see ig) to the right and the index finger forms dahs by pressing the knob to the left. The key will send successive dits when the paddle is held to the right. One dit or a series may be sent depending on how long the thumb pressure is maintained against the paddle. One dah is formed every time the knob is pressed to the left. Dahs must be sent individually. (4) Operate the dit paddle to the right. Hold the lever in this position and stop the vibration of the reed. Adjust the dit contact adjusting screw until the dit contacts just meet. This important adjustment determines whether the dits will be too heavy, too light, or perfect. The adjustment must be made without flexing the contact spring.Tighten the lock nut on the dit contact adjusting screw without disturbing the adjustment.